The Marvel universe line had already been expanding for the past few years, but it explodes this year with a a few new lines of books. There are the "Midnight Sons": Darkhold, Morbius, Nightstalkers, and Spirits of Vengeance (a Ghost Rider / Johnny Blaze team-up book). There are the "Big Guns": Cage, Nomad, Silver Sable, Terror Inc., and Punisher War Zone (a third ongoing Punisher series). There is the Marvel UK line: five ongoing titles and several additional mini-series. Marvel also launches Warlock and the Infinity Watch in the wake of the popularity of Infinity Gauntlet, and that's in addition to this year's Infinity War event. There are also Cable and Night Thrasher mini-series, both of which will lead to ongoings next year. And all of this is on top of the books that were added in the past few years; the only thing that is cancelled this year is NFL Superpro. And of course we have various one-shots and holiday specials and books that go into bi-weekly schedules. And it's outside the scope of my project, but at this time Marvel is also launching its 2099 line of titles set in the future. Marvel is flooding the market. Crossovers are also in abundance. Infinity War has 45 tie-ins across 18 titles. Operation: Galactic Storm occupies every Avengers-related title for 3 months. 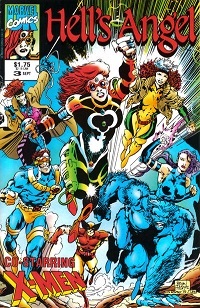 X-Cutioner's Song does the same with the X-Books, and so does Dead Man's Hand for three of Marvel's street level books. 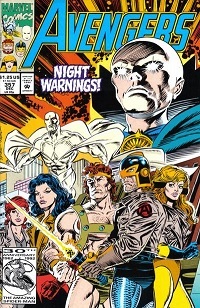 The Midnight Sons books are also introduced as part of a crossover. This is in addition to the crossovers in the annuals, and several smaller crossovers. Gimmicks of all sorts abound: Embossed, foil, and hologram covers. Pop-up centerfolds. Issues polybagged with trading cards. No excuse to publish a triple-priced anniversary issue padded with Marvel Comics Presents overflow material is passed up. The Image Exodus is this year, wherein many of Marvel's top artists follow Todd McFarlane to form a new imprint (and later, company) not long after Marvel backed them over longtime writers like Chris Claremont and Louise Simonson. This leaves the company in a creative lurch. Artwise, Marvel recovers a bit and we see Andy and Adam Kubert, Jae Lee, Brandon Peterson, Greg Capullo, Mark Bagley, and Steve Epting getting higher profiles, and Gary Frank, Liam Sharp, and Bryan Hitch appearing in the UK books (Hitch had already done work on She-Hulk). Sam Kieth is doing covers and some interiors on Marvel Comics Presents. Joe Madureira and Joe Quesada are popping up, too. Most of Marvel's writing, on the other hand, is handled by editors and assistant editors, or new writers that for the most part don't rise to acclaim. Peter David, Dwayne McDuffie (who only writes on Deathlok half the time), Jim Starlin, and Alan Davis (writing and art) are stand-outs. John Byrne's return to the X-Men as a scripter ends quickly, and his Namor run ends this year. J.M. DeMatteis does interesting villain-focused work on Spectacular Spider-Man. Fabian Nicieza sometimes manages to do better than most of his editor brethren. A lot of books feel like they are just treading water or going from crossover to crossover. Marvel buys two card companies this year, Fleer and Skybox. They will wind up selling this part of the business in a few years at a loss (thanks to the speculation crashes in both the comics and sports card industries). For now, this means a major increase in the number of ads for baseball cards and the like in the comics. Marvel's Toy Biz action figure line was expanding, and the X-Men animated series debuts. Regular priced books go from $1.00 to $1.25 with the Feb cover dates, and "prestige" books go from $1.50 to $1.75. And there are so many special books that sometimes it feels like there's no regular price point at all. A Kree/Shi'ar War ends with some Avengers seemingly killing the Supreme Intelligence and the Shi'ar taking over the Kree empire. The Marvel heroes face Warlock's dark side, the Magus, in Infinity War. Peter Parker's parents seemingly return. 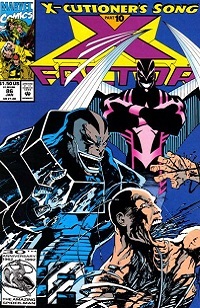 Revelations about Cable and Stryfe are given (or at least hinted at) in X-Cutioner's Song, and the Legacy virus is released. New characters: Carnage, Bishop, Omega Red, Maverick, Trevor Fitzroy, Mikhail Rasputin, the Darkhold Redeemers, Morg. X-Force #6-10 1st Phantazia & Thornn. 1st Externals.